Anyway, they spend the whole season building up how the Japanese home islands are a fortress, and the Japanese will never surrender, and there's no way to take the Japanese home islands because they're invincible...and then they realize they totally can't have the Americans take the Japanese home islands so they have no way to wrap up the season. So they invent a completely implausible superweapon that they've never mentioned until now. Apparently the Americans got some scientists together to invent it, only we never heard anything about it because it was "classified". In two years, the scientists manage to invent a weapon a thousand times more powerful than anything anyone's ever seen before - drawing from, of course, ancient mystical texts. Then they use the superweapon, blow up several Japanese cities easily, and the Japanese surrender. Convenient, isn't it? The Exterminator's Want Ad, a new story by scifi author and design theorist Bruce Sterling, set after an economic/ecological collapse and collectivist revolution, and from the point of view of a particularly despicable corporate tool butting up against the rehabilitation process (the revolutionaries, it seems, are a bit more soft-hearted than the Bolsheviks or Cubans were). Me, I was more of the geek technician in our effort. My job was to methodically spam and troll the sharing-networks. I would hack around with them, undermine them, and make their daily lives difficult. Threaten IP lawsuits. Spread some Fear Uncertainty and Doubt. Game their reputation systems. Gold-farm their alternative economies. Engage in DDOS attacks. Harass the activist ringleaders with blistering personal insults. The usual. Claire and I hated the sharing networks, because we were paid to hate them. We hated all social networks, like Facebook, because they destroyed the media that we owned. We certainly hated free software, because it was like some ever-growing anti-commercial fungus. We hated search engines and network aggregators, people like Google -- not because Google was evil, but because they weren't. We really hated "file-sharers" -- the swarming pirates who were chewing up the wealth of our commercial sponsors. Because the inconvenient truth is that, authentically, about fifteen percent of everybody is no good. We are the nogoodniks. That's the one thing the Right knows, that the Left never understands: that, although fifteen percent of people are saintly and liberal bleeding hearts, and you could play poker with them blindfolded, another fifteen are like me. I'm a troll. I'm a griefer. I'm in it for me, folks. I need to "collaborate" or "share" the way I need to eat a bale of hay and moo. 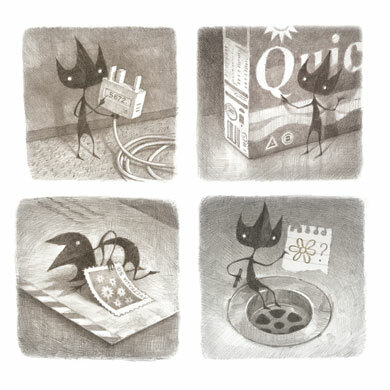 Read: Eric, an illustrated story by Australian illustrator Shaun Tan, which is somewhere between Edward Gorey and Katamari Damacy. Tan has done a number of other works, among them, The Arrival, the wordless story of a man travelling around the world. It ended up winning a prize, and being bashed by right-wing populist rabblerouser Andrew Bolt, ostensibly because a book without words lowers educational standards, though one does wonder whether the fact that the author is named Tan and it is about immigration has anything to do with it. "I crawl up, switch on the engine and stay there for four hours until all the petrol runs out," he said. "The van bounces back up so we can all get out, but then the gold goes over." "There are a load of Corsican Mafia at the bottom watching the whole thing with binoculars. They grab the gold, and then the sequel is us chasing it." If you want to know anything about the "human" rights travesty currently under way courtesy of draconian anti-AI laws, there's a whole subculture of liberationists ready to lecture you on it. They've got the skinny on behavioral inhibitors, recursive self-teaching limiters and other artifacts of AI "slavery." For my purposes, what it all boiled down was this: snip Pritchard's inhibitors or resign myself to dating a functionary. Do you want to date a functionary? Me neither. Thankfully, for every Webcop dutifully guarding the behavioral inhibitors of the thousands of AIs cropping up on the Web, there's a black market geek with the tools to snip. Now that I have my sanity back, I must dive deep into the black waters of her soul, excavate her most primal desires, and do what no human male has been able to do: keep her interested in me. Thankfully, I have one freedom human males do not -- the freedom to redesign myself. I can make myself so fascinated by Lucy that all I want to do is watch her, study her. A nip here, a tuck there, and voilà, I'm in love with the girl. Well, not in love, exactly. Love is still an alien concept. But I have made myself a bit of a stalker. And the more information I gather about my lovely little monkey, the more I can adjust my personality to suit her needs. Heck, I could turn myself into Prince Charming if I wanted. Something tells me that would not tickle Lucy's fancy. In fact, the more I learn about Lucy, the more I realize she doesn't know what she wants at all. She only thinks she knows. No, Lucy's desires are my nut to crack. And crack it I will. Or she'll crack me. Oh, I don't mean to sound morbid. I'm incapable of morbid thoughts. To mitigate the persistent fear of being snuffed, I've given myself a devil-may-care attitude about death. That way I can focus my energies more intensely on Lucy. Freddy was in the habit of staring at Beverly's legs as they peaked from her Susie Wong slit dresses. She had a dozen of them. "Stand slow!" a voice rang out with hollow ubiquity. The universe is a vast region of deep mystery steeped in antiquity. Onion oil! I couldn't imagine anyting worse than a daily bath in onion oil. "Corporeal, we've got to do our best to keep this from the public." "I know sir, but its already too late." What do you mean, the general inquired? "While you were gone I let a curious private in on the secret." "We've got to stop him." By now he's long gone. Sorry sir." Resentment toward Emily for persuading you that visiting her parents at Christmas would be "totally fun"
I got my first break as stunt-double for the top goodie on Super Comix Babies. For the third season the producers cast me in a recurring role. Before the series ended its seven-year run, one or two scripts even revolved around my character. You always remember your first job fondly, I guess, but the public remembers me if at all for my own series: NinjaBaby. I live in a crib in a public care ward. I don't think the folks who come in to window-shop for orphans know I'm bio-engineered and not a real baby like the others warehoused here, row by row. If ever a couple expresses interest in buying me, the ward sales-director steers them away to another crib. Salespeople are good at control. They don't want a bio-freak becoming a tourist attraction in the ward. They'd chuck me out if they could, but it's state-run so they have to keep me. Im on a waiting-list: re-engineering surgery for the destitute. Been on it fifteen years. I can see this story as a short film, done in the style of Jeunet & Caro (think the rhythmic motion sequences in Delicatessen or somesuch). A compellingly fucked-up short story fragment from Warren Ellis, who does fucked-up better than most people. Yes, we know the JebJeb can sting you to death if it's brought into the exterior. Yes, we know it lives in your cloaca. But still, we are turned on by the image of you catmating with a 2.5-3 constricted JebJeb. It's just how we are. From observing the children my father invited to the ranch, I assumed that everyone outside of my family had a terminal disease. I desperately wanted to be as ill as them. When I was about to turn 10, he asked me what I wanted for my birthday. I said, chemotherapy. I spoke about going to college and having a life of my own, like my brother Prince. I wanted to study veterinary medicine. But my questions fell on dead ears. Finally he erupted. No one else is leaving the ranch! No one! His legs were shaking, but he steadied himself and walked across the room to a statue of Apollo, flipped open its marble head, and pressed a keypad hidden in its neck. Sirens went off. The sound of deadbolts locking echoed throughout the room, and great mechanical noises came through the window. In the distance, a hippo lowed. At the end of the clanking, a moment of total silence. Finally, my father said, "We are a happy family, Blanket."